Showing 30 articles from December 27, 2017. OLD HAND. 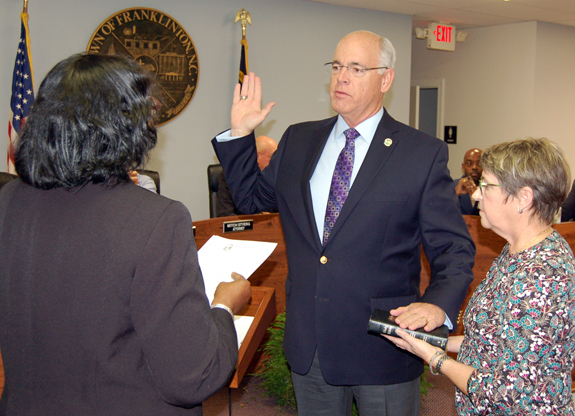 Incumbent Commissioner John Allers takes the oath of office from Magistrate Shirley Fogg with the assistance of his wife, Sheila, during the board's Dec. 19 meeting. FRANKLINTON -- Community safety was a topic of conversation during the board's most recent meeting. During the Dec. 19 meeting, Police Chief John Green Jr. recognized officers for years of service -- making a special note to recognize officers who helped solve the town's most recent murder. Santa had some very special helpers! 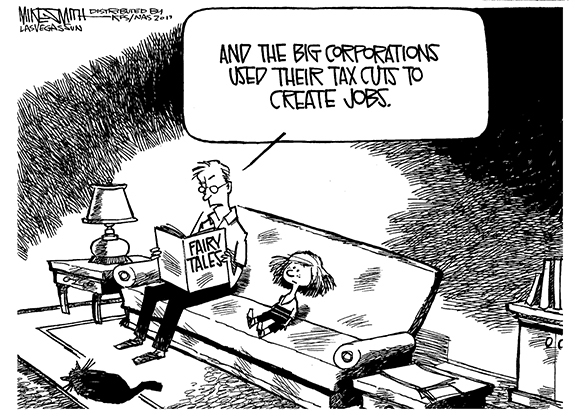 SANTA'S HELPERS. Staff with the Franklin County Sheriff's Office teamed up with the United Way of Franklin County and others to host their annual Shop with a Sheriff event in Louisburg last week. 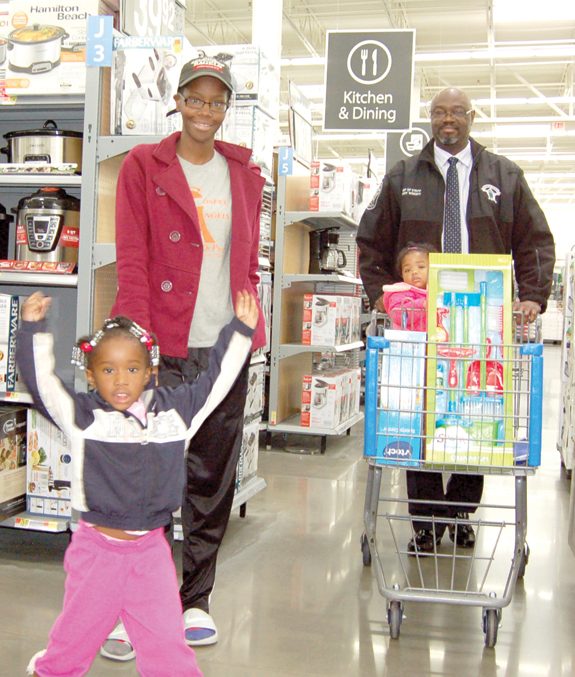 Above, Dania Alston is excited as she shops with her mother, Danette Cooke, sister Dayonna Alston and Sheriff's Office Chief of Staff Terry Wright. Louisburg town administrator Jonathan Franklin has received an award from his alma mater, East Carolina University. 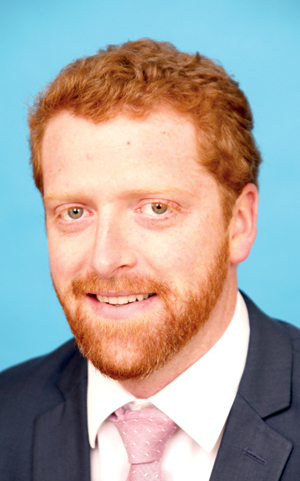 He is among 40 outstanding ECU alumni who will be recognized at a banquet as a member of the 2018 "Class of 40 Under 40 Leadership Award" recipients this year. ECU's Division of Student Affairs will host the Fourth Annual Corporate and Leadership Awards Banquet at 6 p.m. March 24 at the Greenville Convention Center. Local residents reach out to others during the holidays! EMBRACING THE COLD. 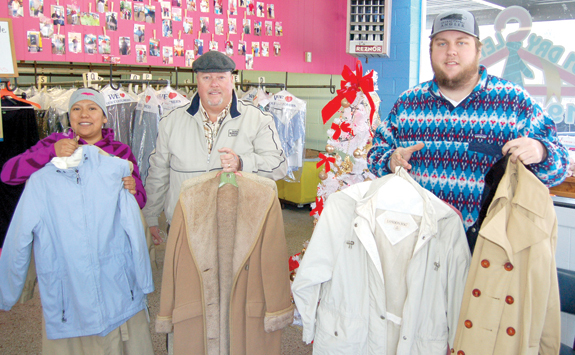 Wayne Champion, center, behind the Coats for Christmas drive, along with Reyna Romero of 401 Dry Cleaners in Louisburg, and Thomas Champion. New or good used coats can be dropped off there, at Farm Bureau Insurance office in Louisburg or the Youngsville library and donated to those in need. For more info, contact Champion at 919-496-2051. Is a 'full house' a good omen for new year? Now that Santa has headed back to the North Pole for much-needed rest and relaxation, many local folks are already looking ahead to a brand new year and the opportunities and challenges it will bring. We hope that you and yours had a safe and Merry Christmas this year -- and that Santa managed to bring you at least a few of the things that were on your wish list. Ready or not, it's the eve of 2018 and a new year of changes, challenges and opportunities await us all, whether we're ready or not! The waning days of 2017 have seen major changes in Franklin County, changes which will become fully apparent as a new year unfolds. One is the planned mid-summer reopening of the emergency room at the former Franklin Regional Medical Center. I often avoid making New Year's resolutions. Certainly, on their face, resolutions sound like a good idea. 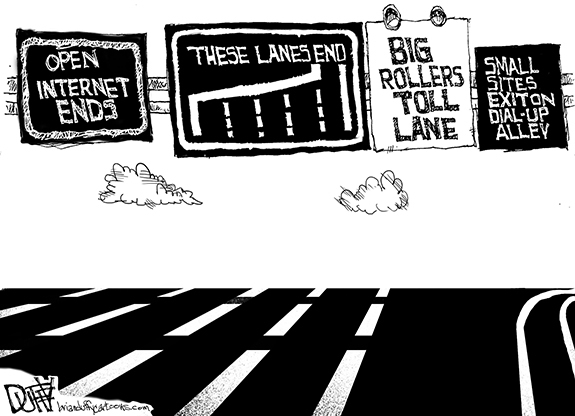 They often revolve around our resolve to change or get rid of an undesired trait or behavior, you know, like automatically assuming that anything a politician says is a lie, or resolving to stop cursing at people in traffic who cut you off. As a student here at Louisburg College and in the community, I strongly agree with Will Hinton. Hinton believes that the Confederate statue should be removed and replaced with the American flag. LOUISBURG--Charlene Ruth Vander Kooi Ten Broek, 74, died Saturday, Dec. 23, 2017. The family will receive friends from 7-8:30 p.m. today, Thursday, Dec. 28, at Lancaster Funeral and Cremation Services, 804 N. Bickett Blvd., Louisburg. Funeral service will be held Friday, Dec. 29, at 2 p.m. at Victory Baptist Church, 475 J.B. Taylor Road., Henderson, with Pastor Ricky Easter officiating. Burial will follow at Lancaster Memorial Park. LOUISBURG--Jennie Elder Burnette Griffin, 70, of Kenly departed this earthly life on Monday, December 25, 2017 at Johnston Health Center. Born on October 25, 1947 to the late John Robert and Susie Elder Burnette. Jennie was one of eight children and she enjoyed times with her family. She retired from Franklin County Department of Social Services and served as the clerk of White Level Holiness Church for many years. FRANKLINTON -- Jerri Hayward Ball, 87, of Franklinton, died on December 20, 2017 at his home. Born in Franklin County to the late George Hayward and Ruby Pearce Ball, Jerri graduated from Edward Best High School and then briefly served in the Air Force. He married his high school sweetheart, Carolyn Jones, in 1949, and they had three daughters who were a source of great joy and pride. WON'T BE DENIED. 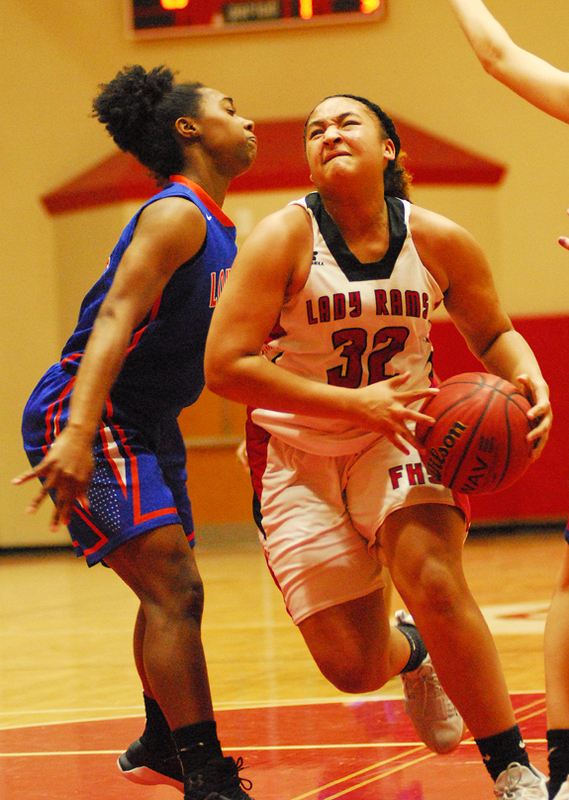 Franklinton High School's Amber Rushing (right) makes a strong move toward the basket last Thursday night against rival Louisburg. FRANKLINTON - With a few of its future league opposing coaches in attendance, Franklinton made one final statement last Thursday before embarking on its eventual Big East Conference schedule. Taking on county rival Louisburg, the Lady Rams put on the defensive pressure early and built a huge lead against a rebuilding Louisburg squad. LOUISBURG -- Thanks to a star-studded freshman class and a solid junior varsity contingent, the future looks bright for the Louisburg High School boys basketball program. However, LHS head coach Michael Sheldon wasn't sure how that young core would translate to success in 2017-18. 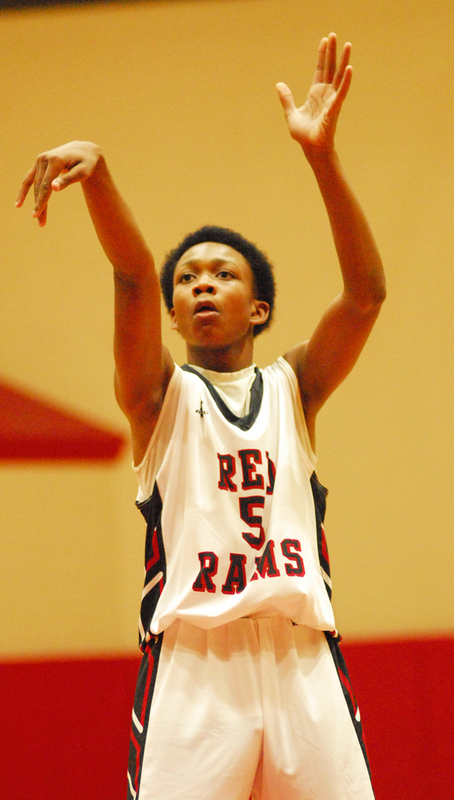 FRANKLINTON -- Franklinton's new presence isn't the only question mark heading into basketball action this season in the always-tough Big East Conference. 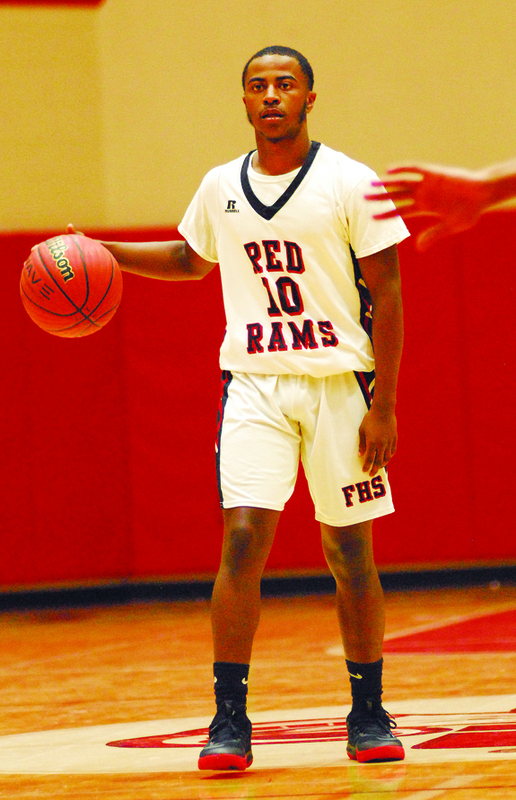 League entrants aren't quite sure what to expect from Franklinton, which is making its move up to the Class 3-A level for the first time in school history after a prolonged period in the Class 2-A Northern Carolina Conference. THAT'S A WRAP. Franklinton's Isaac Nash closes out a pinfall last Friday at the Bunn Dome. 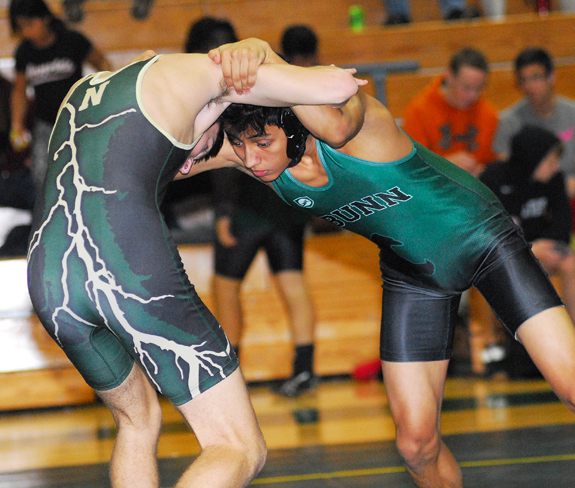 BUNN -- Officially, last Friday's Wildcat Holiday Invitational Wrestling Tournament utilized an individual format -- but that didn't mean eyes weren't glued on the final cumulative team standings. Northwood had plenty of pre-event acclaim, but it was the Franklinton Red Rams who came out on top after the final overall match. BUNN -- Bunn's final pre-holiday stretch wasn't a friendly one for the Wildcats. Bunn, coached by Patrick Reynell, dropped its final two games before Christmas, including a tough 53-52 loss last Tuesday at home against Northern Carolina Conference opponent South Granville. GREENVILLE -- East Carolina University's baseball team has been picked fourth in the 2018 American Athletic Conference preseason poll as chosen by the leagues nine head coaches last week. Louisburg's E.J. 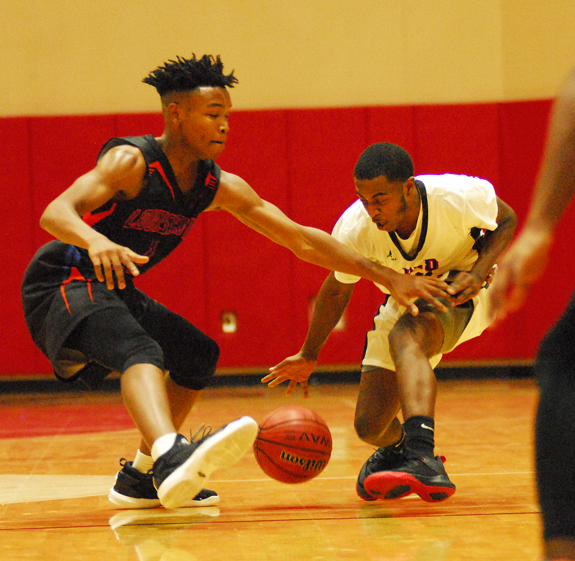 Jamison (left) tries to come up with a steal for the Warriors during last Thursday's boys basketball road triumph against rival Franklinton High School. 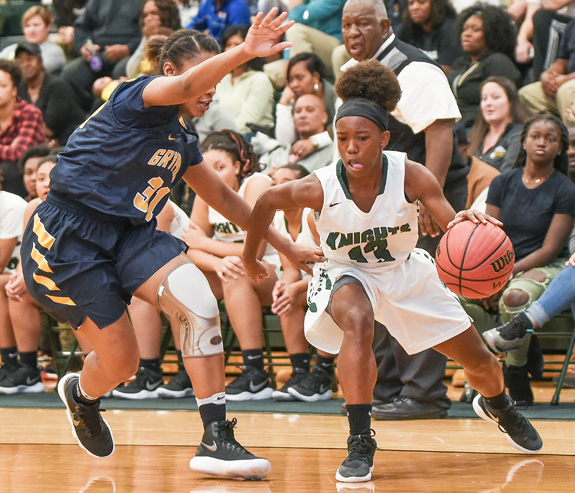 (L to R) Rocky Mount's Faith Richardson and Northern Nash's Kylar Wiggins play on two of the Big East Conference's long-time girls basketball titans. Big East action begins next Friday with Franklinton hosting RM. 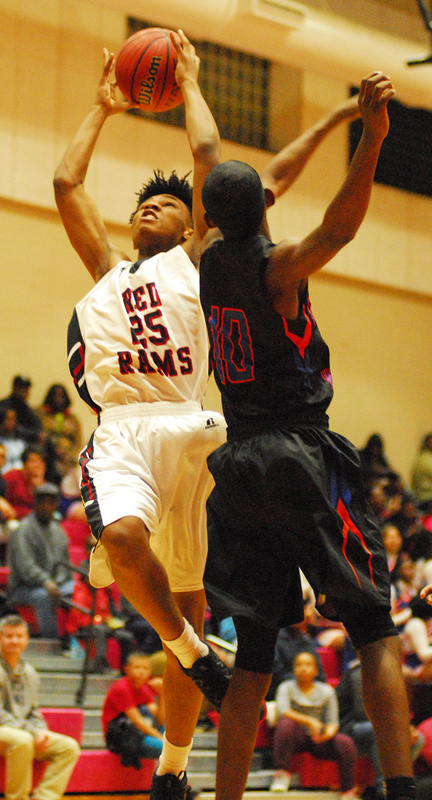 Aiyon Burrell (left) grabs a board last Thursday for Franklinton against rival Louisburg. A Bunn wrestler (right) tries to break free of a clutch during last Friday's tourney action at the Bunn Dome. 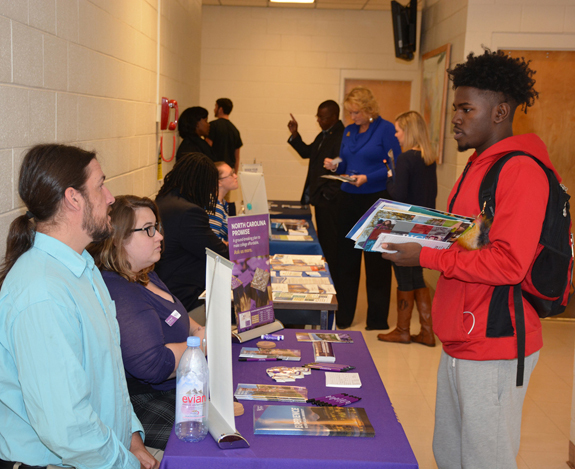 HENDERSON -- Vance-Granville Community College hosted an event to get its students familiar with four-year opportunities. Last month, College Day was held on the main campus where admissions officers from 23 four-year schools spoke with students about topics, ranging from admissions to scholarships to financial aid. MURFREESBORO --Chowan University announced the President's and Dean's List honorees for Fall 2017, including a Franklin County resident. Students with grade point averages between 3.25 and 3.79 for the semester are awarded Dean's List honors. Hannah Marie Perry of Youngsville, a sophomore majoring in Graphic Communications, was named to the Fall 2017 Dean's List. 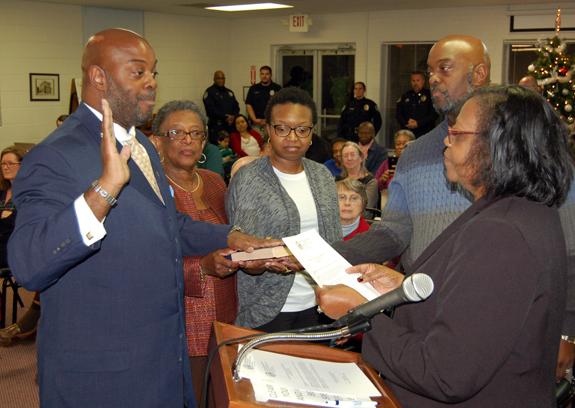 Alvin Holden, left, takes the oath of office from Magistrate Shirley Fogg, right, with the assistance of his mother, Gwendolyn Holden, daughter, Albany Thomas, and brother, Kelvin Holden After being appointed in 2015, this will be Holden's first full term. 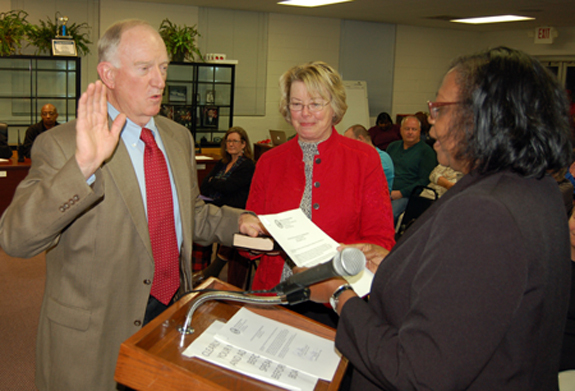 Dr. Philip Meador, left, takes the oath of office from Magistrate Shirley Fogg, right, with the assistance of his wife, Nance. FRANKLINTON -- Town commissioners extended the time they will take to make a land use decision on outdoor gun ranges -- a decision that delighted those who opposed such a prospect earlier this year. During the Dec. 19 meeting, the board also voted to change how a piece of land in town will be used, much to the dismay of a neighbor. LAKE ROYALE -- A man who has butted heads with property management before has filed a lawsuit alleging a police arrest was retaliation for claims he made against the Property Owners Association to the U.S. Department of Justice that they violated his human rights. 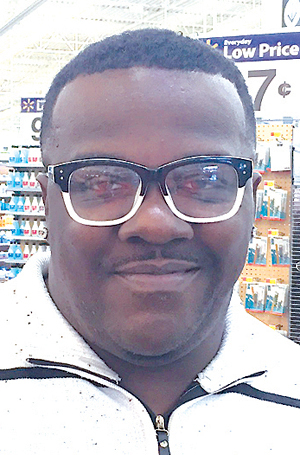 Eric Young is seeking at least $25,000 in damages from a lawsuit he filed Nov. 7 against the Lake Royale Property Owners Association and the Lake Royale Police Department.